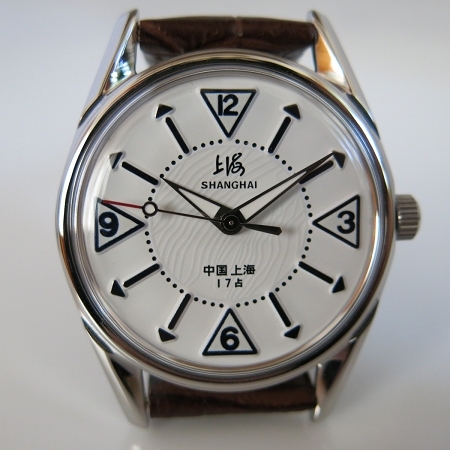 This is a marvelous Shanghai nostalgic white watch rarely found. It is so rarely found that every Shanghai fan will fall in love with. Big 12, 3, 6, 9 are shaped in white and blue triangles. 1, 2, 4, 5, 7, 8, 10, 11 are shaped in blue stripes with small triangles. These unique hour indices are raised so that three dimensional visual effect is created. Wavelike patterns are raised slightly above the middle of white front face. Silver and white, sharp-tipped hour and minute hands get along with the overall design. Long second hand that is decorated by a white dot and red tip, again matches well with the design. Below 12 o’clock is the Shanghai logo. Above 6 o’clock prints “Shanghai China, 17 jewels”. Free shipping is included. Please allow 2 weeks delivery time. Thank you for looking at this product.